Before he became an icon, Ronald Reagan was a paradox: a complex man who appeared simple, at once a genial fundamentalist and a conservative innovator. As America's oldest President, he found his most fervent supporters among the young. The only divorced man to occupy the Oval Office, Reagan as President rarely attended church. He enjoyed a relationship with his own children best described as intermittent. Yet his name was synonymous with traditional values, and he inspired millions of the faithful to become politically active for the first time. During eight years in the White House, Reagan never submitted a balanced budget or ceased to blame Congress for excessive spending. He presided over the highest unemployment rate since World War II and one of the longest peacetime booms ever. It was hard to know what about Reagan, who was elected in 1980 as a bristling anti-communist, offended the foreign policy establishment more: his harsh rhetoric consigning the Soviet Union to the ash heap of history or his scorn for the prevailing doctrine of mutually assured destruction. State Department bureaucrats who tried to censor his speeches, most notably his 1987 Berlin ultimatum to Mikhail Gorbachev to "tear down this wall," threw up their hands when Reagan proposed to eliminate nuclear weapons altogether. Even among his White House staff, admiration for the President's achievements was mingled with a faint whiff of condescension. "He knows so little and accomplishes so much," marveled Robert McFarlane, the third of Reagan's six National Security Advisers. For much of his presidency, Reagan was a sharply polarizing figure. His job-approval rating bottomed out at 35% halfway through his first term. Yet he left Washington more popular than when he first took office, a feat unmatched since Dwight Eisenhower. That's not all the two men had in common. "You know why I like you, Ike?," Winston Churchill asked the wartime commander who had labored, more or less harmoniously, alongside Bernard Law Montgomery, Charles de Gaulle and Franklin D. Roosevelt. "Because you ain't no glory hopper." True to form, in the Oval Office, Eisenhower displayed a paperweight that read, in Latin, "Gently in manner, strong in deed." Equally revealing was the plaque Reagan placed atop his presidential desk. "There is no limit to what a man can do, or where he can go," it proclaimed, "if he doesn't mind who gets the credit." Reagan's modesty set him apart in Washington even more than in Hollywood. As the media succumbed to Gorbymania, Gorbachev's American counterpart laughingly conceded center stage to the Soviet leader, reminding fretful handlers that he had once shared the silver screen with such notorious camera hogs as Wallace Beery and Errol Flynn. With equal sangfroid, Reagan professed not to care what "history" would say of him, on the eminently logical grounds that he wouldn't be around to read it. Scholars and journalists will more than compensate for his indifference. Acknowledging the economic turnaround that occurred on Reagan's watch, they'll weigh over 16 million new jobs and a successful war on inflation against (then) record deficits and a deregulatory binge that saddled his successor with a ravaged savings-and-loan industry. For decades to come, students of the Reagan era will debate Margaret Thatcher's assertion that her American ally won the Cold War without firing a shot. Nearly as intense is the argument swirling around the arms-for-hostages deal known as Iran-contra, a bizarre enterprise born of administrative neglect, wishful thinking and Reagan's all-too-human desire to rescue his countrymen brutalized by their Middle East captors. Under more benign circumstances, Reagan didn't hesitate to poke fun at the supposed confusion in his White House, conceding, "Our right hand doesn't know what our far right hand is doing." That he could laugh at himself was a source of reassurance to Americans who had lived through a series of failed or tragically shortened presidencies. 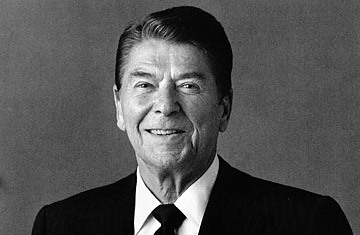 Not the least of Reagan's accomplishments was to refute popular doubts, widespread in 1980, that the office had grown too demanding for any one individual to master. By his own acknowledgment, Reagan arrived in Washington with a script. Indeed, by running in 1980 on a clearly articulated platform of less government, lower taxes, fresh incentives for entrepreneurship and a massive military buildup to counter Soviet expansionism, he could legitimately claim an electoral mandate for what he called his New Beginning. The actor in Reagan instinctively understood that successful leaders don't just speak to us; they speak for us. Certainly, no one who heard his husky-voiced tribute to "the boys of Pointe du Hoc" 40 years after they scaled the walls of Hitler's Fortress Europe is likely to forget the experience. But it was in unscripted moments, far more than any of Michael Deaver's made-for-television stagecraft, that Reagan showed his essential self. Above all, on March 30, 1981. In taking an assassin's bullet and cracking wise in the shadow of death, he displayed qualities of character only hinted at on the campaign trail. The grace and grit he exhibited that day marked the genesis of Reagan's enduring bond with the American people, including millions who never voted for him. See TIME's Ronald Reagan covers.